There is a club run each Sunday, involving a café stop before a return for a late lunch. 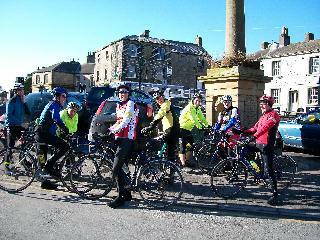 Meet in Settle Market Square at 9.30am for a leisurely(?) social ride. In summer a faster ride happens on Saturdays, starting at 1.00pm. In winter a slower ride happens on Saturdays, starting at 1.00pm. The club was officially formed in 2001, but had existed informally as a group of Sunday morning riders for several years before that. To see how we can justify the club’s original name, please click here. As well as our weekly rides at weekends and our Wednesday evening time trials, various members get involved in various cycling exploits. Click here for a rather random series of stories ranging from the heroic to the downright indolent. 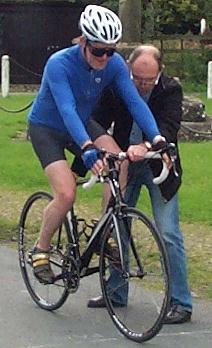 On alternate Wednesday evenings in the summer we run a 10-mile time trial based at Bolton-by-Bowland. Click here for details. There has been strong participation in the Étape du Dales, both as riders and as helpers. Click here for more information. The club has recently obtained support for running British Cycling’s Go-Ride programme.